Make up a big batch of Homemade Hot Chocolate Mix and you'll be set for winter warming and gift giving! this wonderful mix is much more delicious than packaged mixes you can buy at the store, and also much less expensive. For a Christmas gift, pack some pretty mugs, this mix, the recipe to make it, instructions to use is, and some pretty spoons in a basket. Combine the instant nonfat powdered milk, powdered nondairy creamer, powdered sugar, unsweetened cocoa powder, and mini marshmallows in a large bowl and stir gently to mix well. Carefully decant into a large container with an airtight lid. Store in an airtight container in a cool dark place up to 6 months. For one serving, stir 3 tablespoons of the Homemade Hot Chocolate Mix into 1 cup of hot water until dissolved. I prefer using hot milk in place of the hot water, for a richer and more gentle taste. The choice is yours. 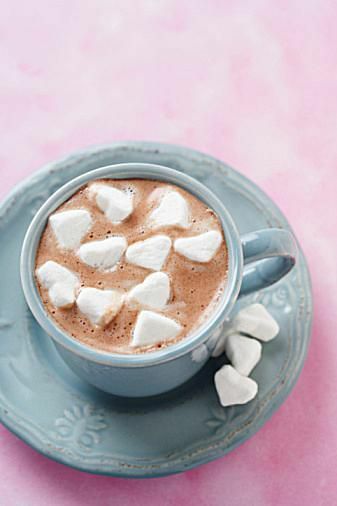 Which Sweet and Salty Foods Pair Well With Hot Chocolate?